Peshawar to Charsadda: Is the NAP adequate to deal with the TTP? Last month, the TTP made a deadly attack on Bacha Khan University in Charsadda. Despite the public anger against a similar strategy in Peshawar in December 2015 (the attack on Army Public School), the TTP seems to be continuing with its strategy. Is the TTP targeting the mainstream education, or have chosen them, because they are soft targets? Why is the State in Pakistan, despite the NAP, unable to neutralize the TTP? With the NAP faltering, will there be more Taliban attacks in Pakistan? Schools and Colleges: Is the TTP targeting mainstream education? The Pakistani Taliban seems to be targeting the schools and colleges because they are soft targets and also because they are main stream educational institutions. The Bacha Khan University system, started by Khan Abdul Gaffer Khan, is based on a secular, moderate and nationalist education. In 2012, the TTP attacked Malala Yosufzai who represented the mainstream education, which TTP was against. The Army Public School was attacked by the TTP in 2014 not only because there were children of army personal, but also because it was a mainstream institution and a soft target as well. Given the enormity of the issue, physical protection of all the educational institutions will be a tough task. So the State will have to pursue a different strategy. A discussion on the NAP assumes importance in this context. TTP’s Continuing Attacks: The Failure of National Action Plan? No armed organization to be allowed to operate. The anti-terrorism organization National Counter Terrorism Authority Pakistan (NACTA) to be strengthened and activated. All sources of funding of terrorists and terrorist organizations to be completely eliminated. Action to be taken to stop religious extremism and protect religious minorities. Complete ban to be imposed on airing the views of terrorists and terrorist organizations in the print and electronic media. Terrorists’ communication networks to be dismantled. Immediate steps to stop the spread of terrorism on the internet and social media. NAP looks good on papers but the reality is unchanged and unsatisfactory. Despite the counter militancy operations and now the NAP, the violence in Federally Administered Tribal Area (FATA) by TTP has been increasing since 2007. Rise of the TTP in Pakistan’s FATA and Khyber Pakhtunkhwa (KP) has also resulted in its expansion into other provinces through Punjabi Taliban and the Karachi Taliban. After Peshawar attack, the State began acting against TTP with an extra vigour through the establishment of military courts, removing moratorium on death sentences and increased air attacks against the TTP. Though there is a tough military action, there seems to be less inputs from the political Establishment in addressing the issue. Besides the seriousness over the NAP between the political and military establishments, the TTP is a well-networked cadre based organization. It draws its forces from both sides of Durand Line and has shown since its inception that it can re-group and re-organize and launch deadly attacks. As it penetrates into the heartland of Pakistani state from its traditional seat of operations, it is emphasizing and consolidating further. The increase in attacks in Sindh, especially Karachi, shows it is no longer confined to the tribal belts. It is also banking on the Pashtun sentiments and using it to score political points. 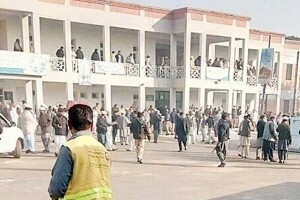 The very fact that many religious based parties and nonpolitical organizations refused to condemn the Bacha Khan University attack shows TTP’s strength and influence. With the existing differences at the State and political levels and the core of TTP remaining intact, the danger of more attacks in the coming days cannot be ruled out.